The South Dakota Livestock Industry Trust Fund was established in 1971, and as Lyndell Peterson tells it, it all started as a casual conversation about how to keep 4-H strong in South Dakota. The South Dakota 4-H program was established in 1963 and in the first 8 years had grown to more than 25,000 youth participants in over 1,500 clubs across the state with 7,500 adult and junior leaders at the helm. Joe Rovere, a member of the 4-H Advisory Council, and Lyndell Peterson, Pennington County Extension Agent, were discussing the drastic loss in funding from national corporations as the entire United States was shifting focus from rural communities to larger cities and urban youth. They hatched a plan that would include a major role for the South Dakota Stockgrowers Association. Lyndell and Joe took their plan to SDSGA Executive Director Jack McCulloh and President Tom Landers and Wilbert Davis and John Younger lent their leadership from the 4-H program. The SDSGA membership heartily endorsed the plan at the 1971 convention. The plan was simple: Coordinate a statewide campaign to raise $500,000 over three years to establish the SD 4-H Livestock Industry Trust Fund as a permanent endowment for the benefit of special 4-H club programs. According to accounts in volume II of “The Last Grass Frontier”, Walt Bones of Parker, Merton Glover of Porcupine, and Forest Ireland of Belvidere were appointed to represent SDSGA on the six-member board of trustees for the campaign. 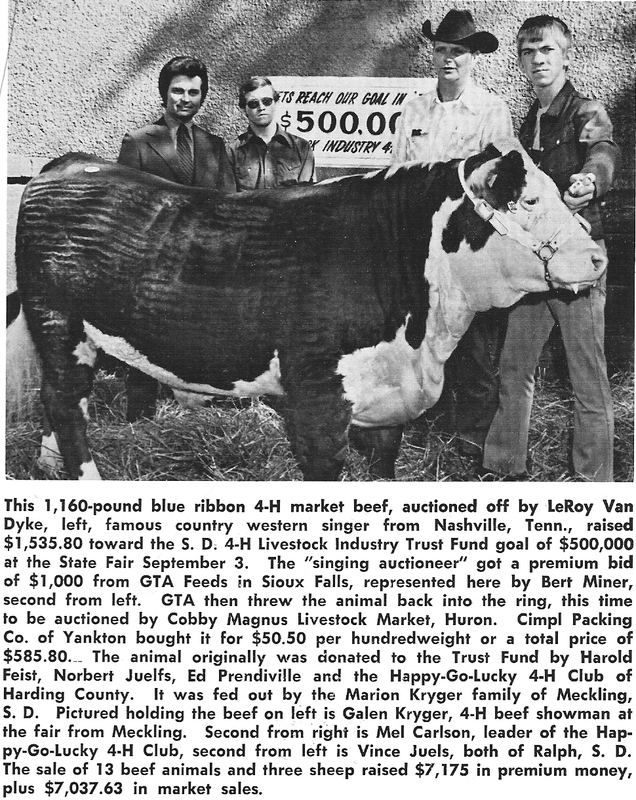 The campaign was officially launched with a calf sale auction at the 1971 State Fair in Huron and was followed by seventeen other calf sale fundraisers across the state. The first of those community auctions was hosted by Tom Landers in Hot Springs and raised $10,300 for the fund. Jack McCulloh and Joe Ro vere spent many hours using the KOTA WATS phone lines to call each and every county extension agent to help make arrangements for calf sales. The fundraising efforts continued and at the 1975 Stockgrowers Convention, President Vince Crago announced that after the first year of investment, the Livestock Industry Trust Fund could contribute $34,758 of earned interest on their account of $531,858 to benefit the 4-H program. Merton Glover, Forrest Ireland, and Florine Glaus were appointed to the fund’s original board of directors. Today the fund has matured and grows as an endowment held in trust by the South Dakota Community Foundation. A series of management decisions and investments have seen the fund grow to just over $1 million, making annual disbursements in support of specific 4-H programs and opportunities for the youth. The fund continues with a nine-member board of advisors, three of which are Stockgrowers appointees, three from the SD 4-H Foundation and the other three represent members of the livestock industry in South Dakota. In the 40 years since the fund began, a steady supply of funding has been distributed to youth in the 4-H programs of South Dakota. 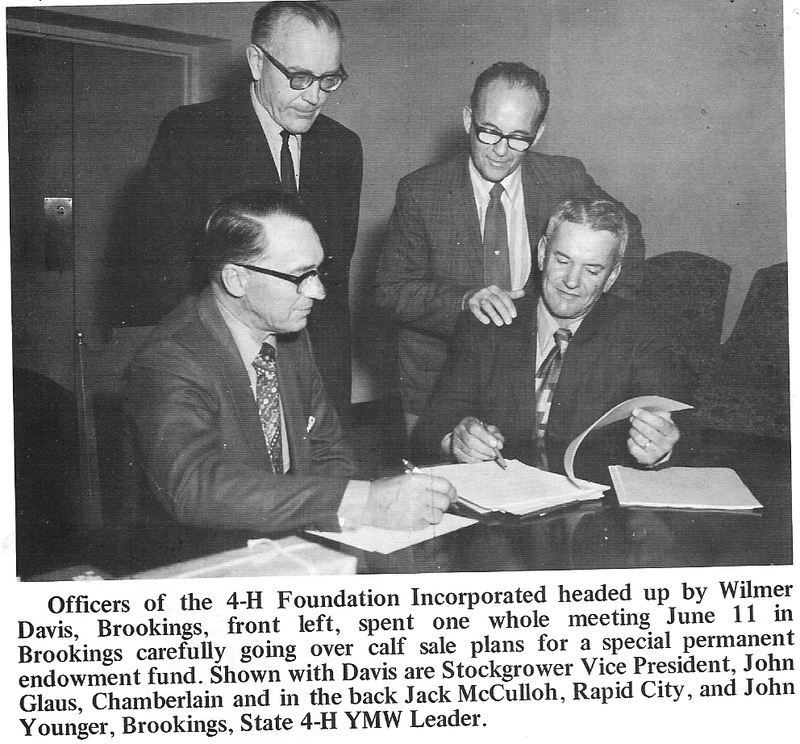 The 4-H Livestock Industry Trust Fund continues to build the legacy of 4-H programs in South Dakota, and stands as a testament to the leadership of the SD Stockgrowers Association, the SD 4-H Foundation, and the men and women whose vision and hard work built this fund. Donations to the fund are gratefully accepted. For more information, please contact the SD Stockgrowers Association at 605-342-0429 or the South Dakota Community Foundation at 605-224-1025.